How many miles of the pitch-black darkness must one walk to be deemed deserving? In July, the story of Walter Carter, a student from Lawson State, an HBCU in Birmingham, Ala., went viral, garnering the attention of state and national news. The story is compelling: a young college student’s car breaks down the night before he was to start a moving company job. After all his back-up options fall through, he decides to walk through the night to a job site nearly 20 miles away—a route that Google maps estimated would take roughly 7 hours. Walter began his walk shortly after midnight. Along the way, he is stopped by a police officer who, after “checking out” his story, gets him some breakfast, and drives him the last leg of his journey. The customers of the moving company were so moved by the young man’s story and their interactions with him, they posted the soon-to-be viral social media post and started a GoFundMe page to show their appreciation. Upon seeing the campaign, the moving company’s CEO drove to Birmingham in his own vehicle, which he presented to the young man as a gift in the presence of cameras and onlookers. “Everything he did that day is exactly who we are—heart and grit. So far, he’s batting 1,000,” said Bellhop CEO Luke Marklin. The campaign has now raised over $45,000 and a local financial advisor has offered Walter pro bono assistance to save and manage his new windfall. Stories like Walter’s are often a welcome respite from a news cycle that seems increasingly polarized and negative. The pattern of media coverage and viral stories like Walter’s—framed around compelling personal narratives—follows a similar script. Person encounters seemingly insurmountable personal roadblock in life. Person overcomes roadblock with incredible personal drive, resilience, and/or faith. A person of privilege, and influential social media presence, shares the story that goes viral. News media pick up gripping personal narrative, with the protagonist receiving generous assistance from an online community (GoFundMe) or a wealthy donor. For those interested in dismantling traditional media narratives about the “deserving” poor, we must ask more of the coverage of stories like Walter’s. We don’t know the full details of Walter’s current financial circumstances. And that’s not the point. If we can agree that getting bogged down in the individual components of one story distracts from a more productive conversation, the bigger question we should be asking is, “What kind of transportation infrastructure is needed to provide a ladder of opportunity for more of our neighbors?” This kind of question, whatever the specific issue, can help us create a region that ensures people who have become most disconnected from the region’s pockets of prosperity have the chance to belong, thrive, and contribute to their communities. Over the last five years as a health insurance navigator as part of the rollout of the Affordable Care Act, I’ve met with dozens of aspiring students (and non-students) young and old, of all ethnicities and life experiences, whose stories will get never media coverage or a cash windfall. There is the young man whose life has been derailed because of a seizure disorder, who is reliant upon expensive medication that prevents him from fully using his automotive repair talents. I’ve met countless aspiring nurses who struggle to figure out how to balance their coursework and practicum in the hospital, with obligations to financially support themselves and/or their families. When they are told by school administrators that they shouldn’t be working while enrolled in a rigorous academic program, they are presented with a decision that effectively locks out most students from securing financial assistance through the Health Insurance Marketplace, as well as Medicaid (in a state like North Carolina that has not expanded the program’s eligibility). When we stop to imagine the magnitude of the lives that are derailed or held back because of the disjointed and broken systems that have created some version a 20-mile walk in the darkness, it presents an opportunity for us to see beyond binaries of “deserving” and “underserving” poor. To get there, we need coverage of essential stories like Walter’s to provide us with context and history that inform how to mobilize public attention and problem solving to address a community’s critical challenges. But it’s easy to get wrapped up in the details of Walter’s story. It’s much harder to ask the tough questions about the systems that support or inhibit opportunity. Once we ask those questions, there are tough decisions and changes that a community must embrace to ensure that the conditions that underlie Walter’s story are not the defining reality for most families with limited resources. If we are going to get serious about the challenges to creating a more equitable South—one where young adults growing up in low-wealth families can thrive—we must create a narrative and a way of storytelling that acknowledges not only individual compassion and generosity (as well as “heart and grit”), but also raises the truly important questions about the broader set of conditions for every person who doesn’t find the spotlight. For more on how system-level investments strengthen the infrastructure of opportunity, check out our new brief: Moving on Up: Transportation and Economic Mobility. Who Counts? Whose Voice is Heard? The Trump Administration’s recent request to add a citizenship question to the upcoming 2020 Decennial Census has revived a contentious debate concerning the rights and privileges of political voice and power in our democracy. This debate, and the ugly compromises embedded in our country’s founding documents, are often centered around a simple question: In a representative democracy, who counts, and whose voice is heard in the halls of Congress or in our state and local governments? Though the current answer to this question is more inclusive since our founding, the intentions of this latest effort, particularly in the backdrop of rhetoric and a contentious debate surrounding the issue of immigration, should cause us to reflect seriously upon what values and principals will guide the future of our democracy. All this points to the importance of having an accurate 2020 Decennial Census. The significance of the results is hard to overstate: a comprehensive count of all the people in the U.S. portends a shakeup of political power and voice that affects every facet of our lives. Through a process known as apportionment, 435 seats in the House of Representative will be allocated across 50 states in time for the 2024 presidential and congressional elections (U.S. territories and the District of Columbia have a representative, but not an actual vote in Congress). Some states are aggressively pursuing strategies to avoid the loss of a congressional seat, while other states are eagerly and confidently anticipating one or more new seats. The factors influencing the potential shakeup of congressional apportionment are complicated; they include recent natural disasters (e.g. Hurricanes Harvey, Irma, and Maria), immigration and migration patterns, the lingering effects of the Great Recession and the housing crisis and, increasingly, the availability of jobs. Defending its request to add a citizenship question to the Census, the Trump administration defends its efforts by suggesting it needs more data to properly enforce the Voting Rights Act; skeptics and immigration rights advocates suggest that the natural consequence will be lower response rates (leading to a more expensive survey) and heightened distrust and anxiety among both legal immigrants and undocumented populations. Most controversial, however, is the idea advanced by a small contingent of congresspersons that it would wholly exclude the count of undocumented residents for the purposes of apportionment—a debate that combines hardline immigration policy with a political calculus driven by an effort to curtail the influence of more urbanized and coastal communities that are home to substantial portions of immigrant and undocumented populations. To tackle the complex intersection of issues that are core to the work we do at MDC, this post will serve as the first in a five-part series about the 2020 Census, and more broadly an examination of country’s history of who gets counted and whose voice is heard. The five themes covered will include a Southern perspective on congressional representation (through apportionment) and political power, gerrymandering, immigration, and race. The final post will discuss how the continually eroding trust in our core institutions, like the Census, threatens to jeopardize community-driven efforts to build an inclusive and an equitable Infrastructure of Opportunity. In each of these pieces, we aspire to offer a positive vision for how the South can acknowledge its unique role as home to our country’s most painful history, and more importantly, how we can emerge as a region that is increasingly characterized by equity and opportunity for all. In this first post, we’ll discuss the controversial origin of the South’s political power (e.g. 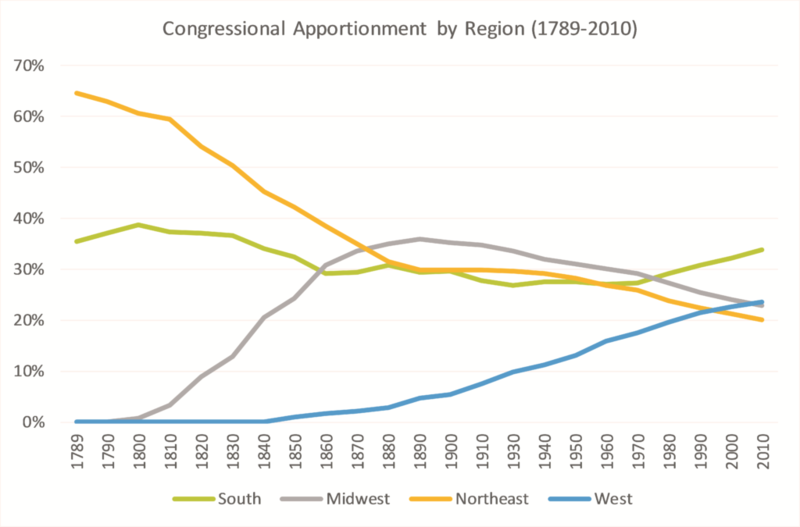 congressional representation) and how the continued growth of the region portends considerable influence in shaping the country’s direction for decades to come. In prioritizing the formation of a stable government over addressing the issue of slavery following the Revolutionary War, our country’s founders came to what is now commonly called the “Great Compromise.” To win over a powerful contingent of Southern representatives to the Constitutional Convention, our country’s founders created a bi-cameral legislature with a House, where membership was determined by state population, and a Senate that would have two representatives regardless of population. 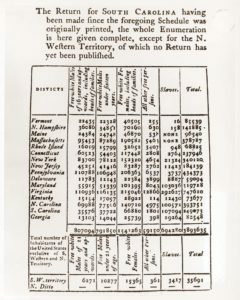 The first census in 1790 was a count of the U.S. population by U.S. marshals who recorded the name of the head of household and the count of persons using only five categories: the number of free white males (under and over age 16), free white females, all other free persons, and slaves. The Census results produced the first clear portrait of the institution of slavery—a system of oppression and economic dependence that the South, which was home to the clear majority (78 percent) of slaves living in the U.S., was desperate to keep in place. 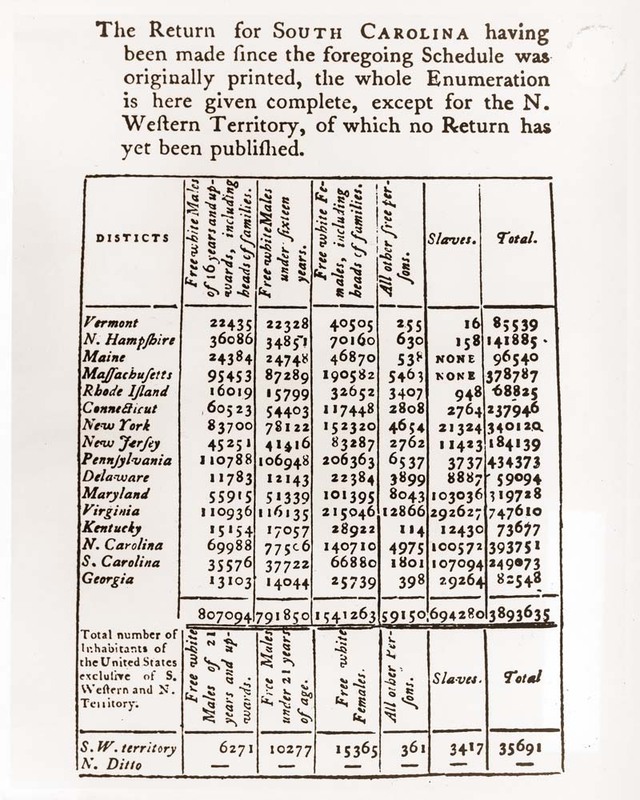 With only 65 House seats at play for apportionment, the region ended up securing 23 (or 35 percent) of the seats—a result that solidified a voting block that effectively rejected sustained efforts to dismantle the institution of slavery. It took another 73 years, with the election of President Abraham Lincoln, and the secession of Southern states from the Union, that ultimately led to the Civil War and the formal end to slavery. It required three Constitutional Amendments (the 13th, 14th, and 15th amendments) to officially mark the end of slavery, craft a new definition of citizenship and equal protections under the law, and the right to vote regardless of race, color, or previous condition of servitude (the voting franchise wasn’t guaranteed for nearly 100 years). Even though the South would go on to lose more than 6 million African Americans during the Great Migration of 1910 to 1970, and the simultaneous rapid westward expansion and formation of new states, the region’s political representation in the House of Representatives never fell below 27 percent of the current chamber size of 435 representatives. 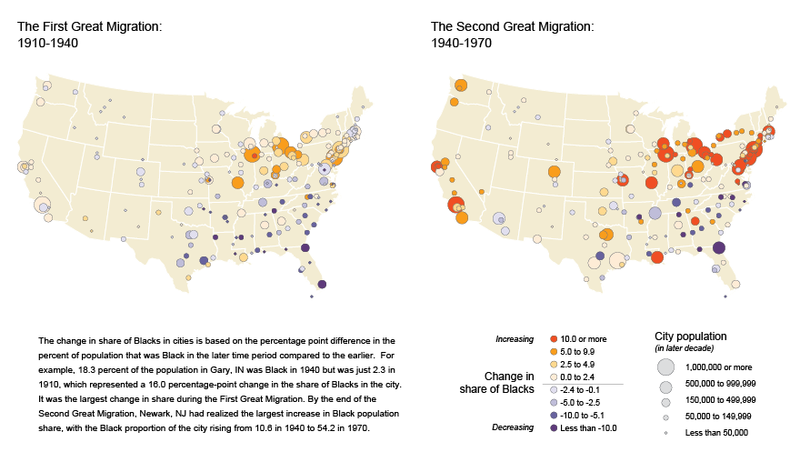 The South’s distinct and ugly history during the period of Reconstruction, Jim Crow, and the Civil Rights era (and perhaps beyond) can be summarized by a struggle for the heart and soul of the region (often overtly violent, but also backed by a multiplicity of forms of de jure segregation) and its position on of equal rights and representation of African Americans and other oppressed populations. 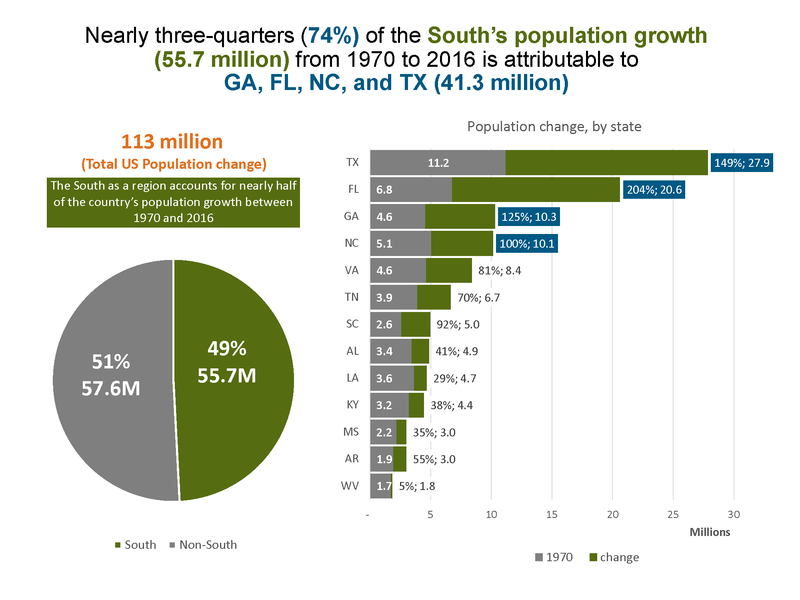 The portrait of today’s South eloquently described by MDC’s Senior Fellow, Ferrel Guillory, as a place that “has a contradictory economy, polarized politics, an anxious populace, a divided head, and a conflicted heart” is precisely why the upcoming 2020 Census, and the resulting apportionment, are an important benchmark for the region’s future. With substantial population growth since 1970 (accounting for 49 percent of the country’s population growth), the states of Georgia, Florida, North Carolina, Texas, and Virginia have accounted for the net increase of 26 House seats since the 1913 reapportionment. Alternatively, the states of Tennessee, Louisiana, Alabama, Arkansas, West Virginia, Mississippi, and Kentucky accounted for a loss of 21 seats during the same period (South Carolina held constant at seven seats). 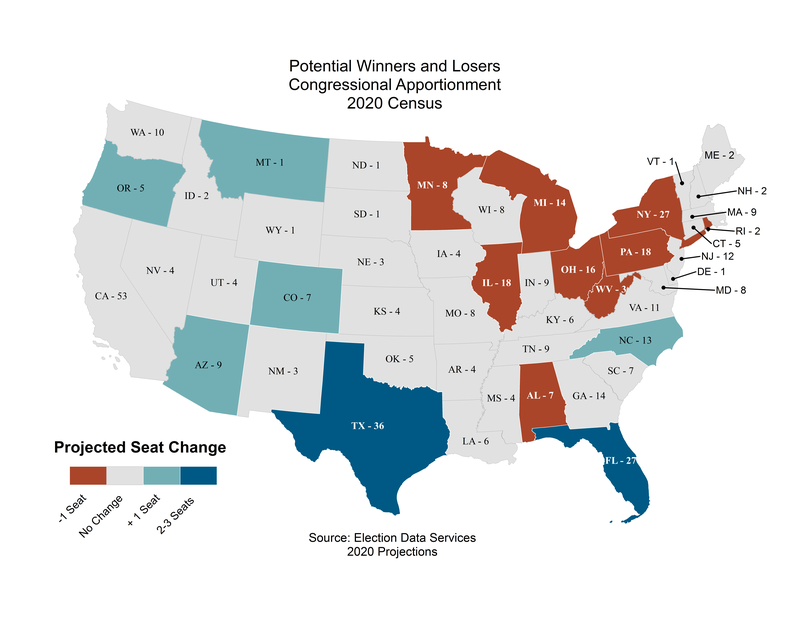 Election Data Services, a political consulting firm, recently completed analysis of the specific states that are likely to be gain or lose seats through apportionment following the 2020 Census. Based upon their latest analysis, the South and West are estimated to add a net of four congressional seats, while the Midwest and Northeast are projected to lose a net of four and three seats, respectively. As shown on the map below, the core states of the Rust Belt (including the states of New York, Pennsylvania, Ohio, West Virginia, and Michigan) are all currently expected to lose at least one seat. Meanwhile, the Southern states of Florida (+2), North Carolina (+1), and Texas (+2-3) are all expected to gain seats.. While unforeseen circumstances (legal challenges, natural disasters, and unreliable or suppressed counts) may still affect the outcome of the final Census count, and the state-by-state tallying of congressional seats following the 2020 Census, one reality seams all but certain – the South is going add seats to its congressional delegation. The big open question is what affect our polarized politics, and conflicted heads and hearts, will have on how the maps for new congressional districts are drawn. With no shortage of challenging issues to tackle on the horizon, recent evidence suggests that the principals and practices (let alone the art and science) of crafting new congressional maps will either work to strengthen or harm the region’s ability to embody a place where all people can belong, thrive and contribute. In our next post, we’ll examine the process and history of drawing congressional maps and how these they can be used as a tool to better represent the diversity and character of the modern South. Happy holidays from MDC and the State of the South blog! This is a time of year where many of us pause to be reflective. For some, it’s a season of advent: of waiting in stillness for something we hope for. For some, this is a season of celebrations of culture and self-determination. Many of us may be reflecting on our 2017 new year’s resolutions, asking ourselves what we accomplished this year and setting goals to move forward. MDC is also especially reflective these days, as we celebrate our 50th anniversary. As part of our upcoming events to mark this milestone, we’re releasing a new edition of our State of the South report in early 2018. 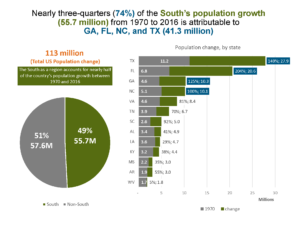 This report will look back at the state of the South over the last 50 years, examine the present–both our assets and challenges—and consider how we must work toward a future of shared well-being. In that way, you could say MDC is encouraging the South to have a moment akin to what Ebenezer Scrooge experienced in Charles Dickens’ A Christmas Carol. In Dickens’ classic Christmas tale, Scrooge must confront his past, acknowledge his present, and change his future, or else suffer a fate he does not want. Our 2018 report will encourage leaders in the South to ask themselves similar questions about the direction of the region: to take stock of the past, address the realities of our present, and actively participate to shape a future that benefits all. I wonder what a Southern Christmas Carol would look like? In Charles Dickens’ original story, the “Ghost of Christmas Past” shows Ebenezer Scrooge flashbacks of his own past. In the process, Scrooge sees examples of generosity shown to him. But he also sees himself sink into loneliness, because he values his own money and profit above all else. Surely the South can relate to both being the beneficiary of generosity—and to clinging tightly to our own wallets. That’s not to say that the South isn’t itself a generous region. As we’ve just described in our report produced in partnership with the Southeastern Council of Foundations, the region is home to a multitude of philanthropists who care for their home communities. In addition, the concept of “Southern hospitality” conjures images of families opening their homes, widening their dinner tables, and supporting their neighbors through difficult times. However, when we look at systemic investments in practices and institutions that change the odds for people living with poverty and economic insecurity, rather than helping them overcome the odds, we start to get a different picture. All the marching and court rulings did little to change some southerners’ hearts. A 1968 survey found that eighty-three percent of whites said they preferred a system with no integration. And they acted on those preferences. 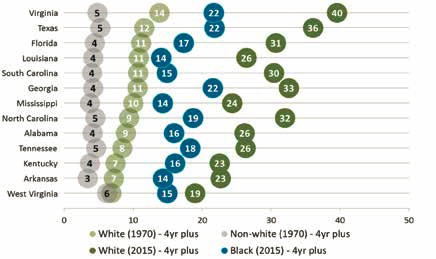 By 1970, 158 new white private schools had opened up in Mississippi. By 1971, a quarter of the white students were in private schools, the white families paying tuition many could scarcely afford. What if the “Ghost of the Southern Present” came to visit? We might breathe a sigh of relief, ready for some good news and knowing that things can’t be as bad today as they were 50 years ago. In Dickens’ tale, Ebenezer Scrooge sees the present from a new vantage point, and this forces him to acknowledge issues that were around him all along, but that he did not want to see because it was inconvenient to his own greed. When Scrooge sees clearly the reality of his employee’s life, struggling to support an ill son (Tiny Tim), he sees the present with new eyes. Here at MDC, we hope our 2018 report will also encourage leaders across the South to see our present with new eyes. 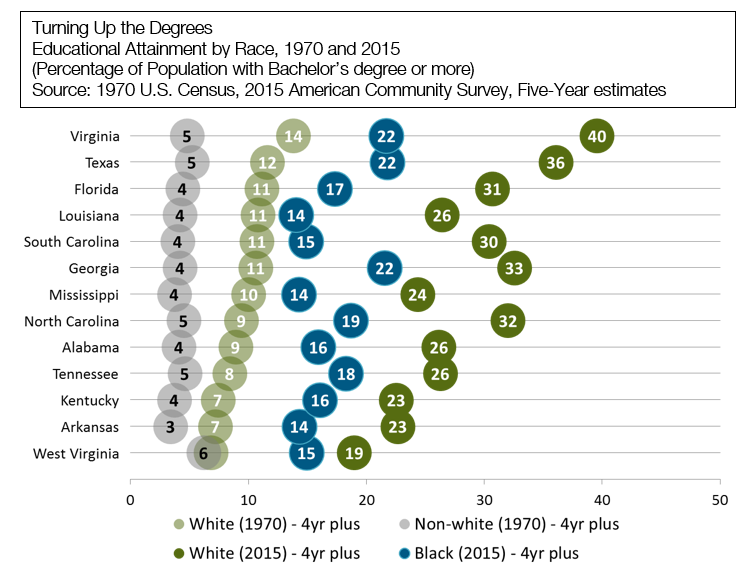 Because while the South has made progress increasing equitable conditions in education, there is still much to confront—or as we say, the state of education in the South is better than it was, but not good enough. But the “Ghost of the Southern Present” might show us something else, too—something MDC has seen in our work with community colleges, leaders in higher education, and other concerned residents across the South: a determination to address systemic problems, value student voices, and expand access to education. For example, in a forthcoming report for the ECMC Foundation, we saw the thoughtful way Southern community colleges are making transfer easier for students who aspire to attain a four-year degree. Through our work with Healthy Places North Carolina, an initiative by the Kate B. Reynolds Charitable Trust, we see how community college leaders are ensuring their students have access to the resources they need to maintain a healthy diet and lifestyle. And we’re now seeing North Carolina establish a statewide educational attainment goal through My Future NC, a commission designed to advance this goal with attention to equity. Like Ebenezer Scrooge, the region has a choice to make going into 2018. Leaders in the South can soberly confront the region’s past, clearly examine its present, and choose to proactively shape our future, so that the South is a place of shared well-being. We hope you will be on the look-out for our report in 2018 and consider together with us the kind of place we want the South to become—and what we need to do now to make that happen. If you travel to the rural Ozark Mountains, you may be surprised to find one of the most dynamic postsecondary institutions in the nation. Located in Harrison, Arkansas, North Arkansas Community College, not only offers education beyond high school for an area that has limited postsecondary options, it offers programs that provide career counseling, assistance with accessing government resources such as housing and day care subsidies, and financial literacy and management training to individuals and families across the rural region it serves. NorthArk is just one example of the ways in which community colleges can help build an infrastructure of opportunity in non-metropolitan communities across the South. Indeed, for many communities in the rural South a two-year college is the only postsecondary institution in geographic proximity to local residents—and as such, it can, or at least should, play a driving force in improving the economic health of a region. Among other activities this can mean preparing a region’s current and future workforce for job opportunities in the area or helping students pursue higher education opportunities elsewhere. But if the South has traditionally held one educational advantage over the rest of the nation is the sheer number of community colleges in each state. In most Southern states, these two-year institutions’ reach is far and wide including in rural areas. Take a look at the counties with the highest poverty rates in each of the 13 states (in every one but Virginia, it is a rural county); in most cases, a community college provides services at a location within a 30 mile drive of the county seat. (Of course, rural transportation can in many cases make even that distance daunting). Of course, not all community colleges are created equal and success requires leadership with the foresight and fortitude to respond to difficult challenges. But throughout our work, especially recently as we work with rural places across the South to build an infrastructure of opportunity, we remain convinced that these dynamic institutions at least hold the potential to address some of the biggest challenges facing rural communities. We see a variety of roles that community colleges can, and in many cases do, play in assisting in improving the economic vitality and potentially increasing the economic mobility of rural communities. The traditional role of preparing individuals, no matter what age (the average of a community college student is 29), for entering the workforce is of course at the core of any postsecondary institution’s mission. And increasingly, an associates degree is required to get a job that requires a family-supporting wage. 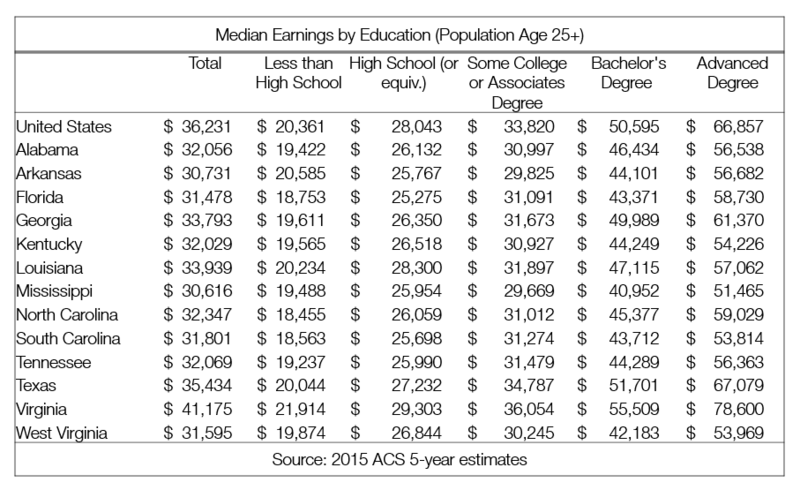 For example, in a report on the Arkansas labor force commissioned by the Winthrop Rockefeller Foundation, we found that 84 percent of openings that pay a family wage will require at least an associates degree compared to only 21 percent that require an high school diploma or less. Effective community colleges prepare students for either the workforce or to transfer to four-year institutions. And increasingly community colleges, including those in rural areas are working with their K-12 systems, to make sure students are prepared for the challenges that students will face when they enter the world of postsecondary education. Of course, preparing students for a job if there is no job to be found in a community is inherently problematic. Effective community colleges operate in constant contact with local industry to ensure that they are meeting the stated demand for skilled workers. And it is important that industry’s role not just be traditional industry advisory boards that meet once a year to listen to a PowerPoint presentation about programs at colleges. Effective institutions remain in constant contact with industry to understand their current and projected needs, along with getting the data support they need from state systems to understand industry growth patterns to see where new opportunities may rise. And community colleges not only work with individuals who are entering the workforce. Community colleges can work with existing industry to train or retrain their workers to make sure their skills stay up to date. Again, getting involvement from industry at more than a perfunctory level is vital to ensure that the services offered through the college are meeting the needs of the community at large. While the two roles described above could describe the role of any community college regardless of location, you should remember that in rural areas, these colleges are the only post-secondary institutions that serve the area. The next roles are ones that if not unique to rural community colleges are critical to building an infrastructure of opportunity for these traditionally struggling areas of the South. One of the keys, if not the key to building an infrastructure of opportunity in a community is building effective community partnerships. But to build an effective partnership, a region needs a leader that is generally trusted by the broad community (residents, government, non-profit and private sector) and can have the capacity to rise to the challenge. And in many rural places, community colleges are the only institution that fits the bill. When MDC rolled out its recent report on economic mobility in North Carolina, we traveled to communities across the state to not only report our findings but to start the conversation on how to create an infrastructure of opportunity. In each rural area we traveled to, we engaged with the local community college to contact a wide variety of individual to attend and participate in a real way in a new effort aimed at community change. An outside entity like MDC or even a less trusted or known local institution would not have commanded the response or participation did our community college partners in places as varied as rural Central North Carolina or the foothills of Appalachia. One of the most important roles that community colleges play in rural areas especially is reaching beyond just the students they serve to provide resources to the surrounding population. And continuing education is just one role that these colleges can play that might be lacking otherwise Let’s just look at two examples: improving a community’s residents fiscal well-being and its health. Community colleges provide financial management and financial literacy training and support to communities where these services may not be offered. Phillips Community College and several other rural colleges in Arkansas, for instance, provides a wide range of services to both students and the community at large. These services can be as simple as learning to budget already tight finances to steering students and community members to needed public benefits that they otherwise not have been aware. These institutions can also have a real impact in a region’s quality of life including enhancing health outcomes. For instance, MDC’s Healthy Places NC program through a grant from the Kate B. Reynolds Charitable Trust, is working with seven community colleges across the state to develop new strategies to improve healthy outcomes across rural North Carolina. Community college projects include offering a telemedicine site in rural McDowell County in the western part of the state and building walking trails on a campus in Beaufort in far Eastern NC campus that can be used by all community residents. In addition, community colleges often host health care navigators who can sign up not just students for health insurance but community residents as a whole. The above four roles are broad and a lot can fall under these categories. And as stated, not all community colleges are able to provide these services to their residents. Many community colleges that serve rural areas have difficulty attracting the leadership and faculty necessary to meet their full potential. But as with all the challenges facing rural communities, there is great potential to rise to the occasion. 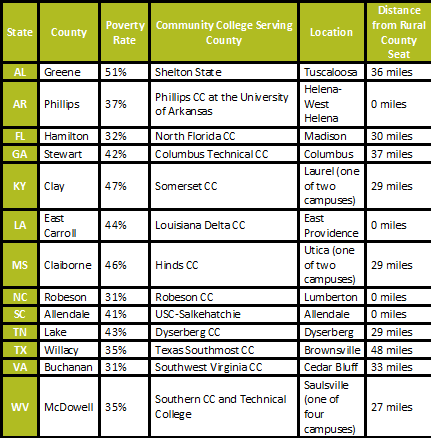 Does your community college meet the needs of rural communities in your portion of the South? If not, what are the barriers you see? Are they local or state in nature? We’d love to hear your thoughts.